It’s hard to say no to more of a good thing, and Marvel’s Spider-Man is a good thing. Insomniac knocked it out of Central Park with the Spider-Man fantasy that they crafted, and despite the rote open-world “checklist” design, still managed to capture our hearts with a story that is as much about the human as it is about the spider. The Heist is the first chapter in the three-part DLC series for Marvel’s Spider-Man, an arc called The City That Never Sleeps. Setting players swinging through New York and once again dealing with as many Peter Parker issues as Spider-Man ones, The Heist plays it safe, rather than stepping outside of the masterfully crafted Spider-Man fantasy we got in the base game. Opening with a heist (surprise) by Black Cat, The Heist picks up shortly after the end of the campaign and expands on the relationship between Peter and Felicia that was only touched on briefly by side objectives in the main story. Peter’s got a few things to work through with this past romantic relationship, and he’s put squarely between his thief of an ex and Mary Jane, which causes some understandable friction. One of the best aspects of Spider-Man has always been his ability to work out his personal life problems while swinging through New York. The Heist plays up the alone time that Peter gets while skimming the rooftops. Miles is also forced into the DLC, while not actually playing any kind of a role in the story. Some limited phone calls with Peter do play up on the reveals that came at the end of the main game’s campaign, but if they were not there, it wouldn’t change things at all. They are fun little conversations though, but in content so small, they feel decidedly out of place when they don’t tie in to anything else. Perhaps this will all lead to something in the next two DLC chapters, but I honestly don’t see it going anywhere until the inevitable Spider-Man 2. J. Jonah Jameson is back with more Just the Facts, and as if Insomniac wanted to further antagonize my disdain for the character they turned JJJ into, they made him use identical quotes to Trump (“Nobody loves women more than J. Jonah Jameson.”). Mary Jane gets another one of her staple stealth gameplay segments, still feeling just as awkwardly out of place as they do in the main game. You are ripped away from the Spider-Man superhero fantasy, slinking through a back alley that’s carved into a path like a cheap haunted house your dad put together in your garage. It only serves to highlight the character’s relative helplessness. Marvel’s Spider-Man is constantly trying to build Mary Jane up as a strong character, but her weak linear gameplay sections do her a disservice in comparison to Peter’s citywide freedom. Gameplay is basically what you’d expect, with almost no changes from the main game. Peter does get an extra gadget to use for a single Screwball challenge, and there’s one tough new enemy type to fight, but for the most part, you’re looking at the same traversal and combat mechanics. Some of the fights are even more frantic and tough than those in the first game, but the ones with interesting twists (like stopping thugs from escaping a museum with stolen art while fighting a ton of them) are one-and-done combat scenarios that don’t get explored further. The three new suits are little more than visual changes, with no new powers or abilities. If you’ve already maxed Peter out in the main game, the expansion doesn’t give his skill tree anywhere else to go. The Heist is all about expanding on the story, and even there, by the end it’s very clear that this is only the first chapter of a larger story arc. It might be worthwhile just to wait for all three instead of playing them piecemeal. To play The Heist, you’ll need to load up your main game and then select the DLC from the menu. This loads up a new instance of the same map just for the DLC, but with as sparse as The Heist’s relative content offering is, I wish they had found a way to ingrain the activities into the normal game’s map. It just doesn’t feel like there’s a lot to do in The Heist’s version of New York, a map that was definitely designed with a full game’s content in mind, not a $10 add-on. There are 10 paintings to find and six new challenges hosted by Screwball. Multiple of the uppermost and lowermost districts aren’t even utilized for this DLC. What worries me most about The Heist is that the DLC campaigns will only show how much Marvel’s Spider-Man relies solely on the Spider-Man fantasy to work. The basic (and short) open-world checklist of things to do is ever more apparent here, placed within a largely empty instance of New York City that doesn’t have the same kind of saturation of activities that the main game does. Having the whole of New York City at your fingertips gets old when there’s not much to do in it. While The Heist has a strong story—or at least the start of one—it doesn’t fill out the world or give Peter any additional gameplay growth. Mary Jane gets another boring stealth segment. There’s a single requisite set of collectibles. Added suits give visual flair only. Embracing Peter’s human side as he swings through the city was always a strong point of Marvel’s Spider-Man, but I had hoped the DLC episodes would begin to improve on some of the weaknesses in the main game. Instead, The Heist makes them more apparent than ever. Perhaps the complete The City That Never Sleeps arc should have been released as single robust expansion, rather than three piecemeal episodes that are just giving us more Spidey at a trickle. 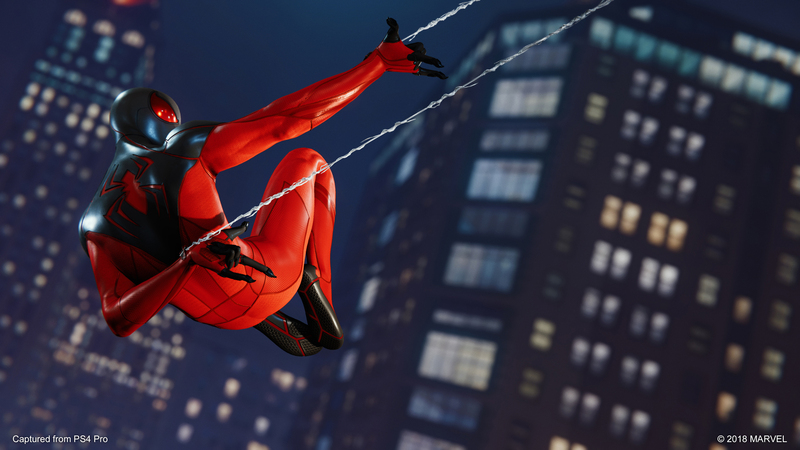 Marvel’s Spider-Man The Heist review code provided by developer. Version 1.08 reviewed on a standard PS4. For more information on scoring please see our Review Policy.